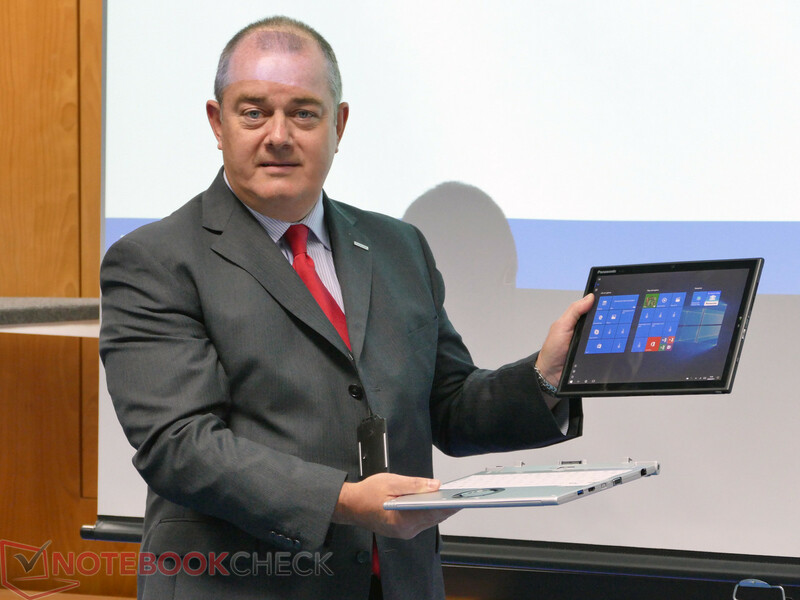 Toughbook goes Business. 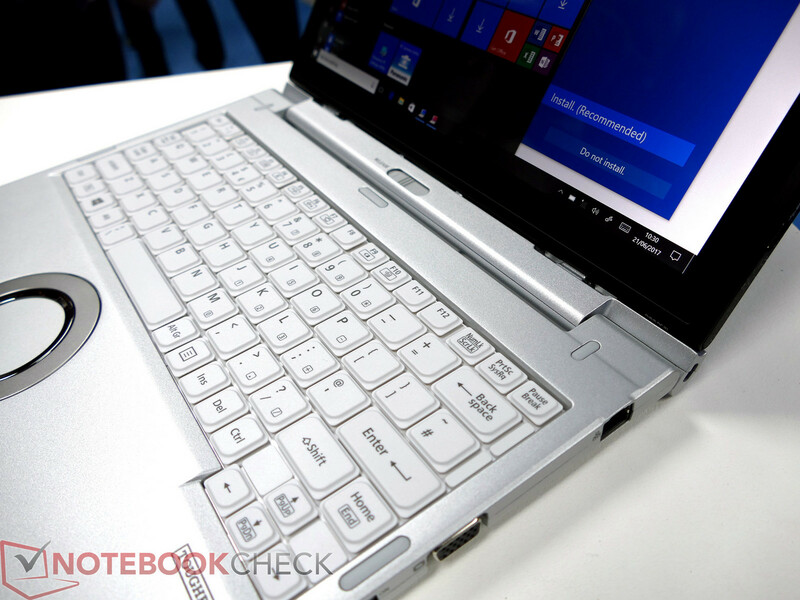 With the new CF-XZ6, Panasonic has announced a particularly slim convertible for the first time, which is aimed at business users. 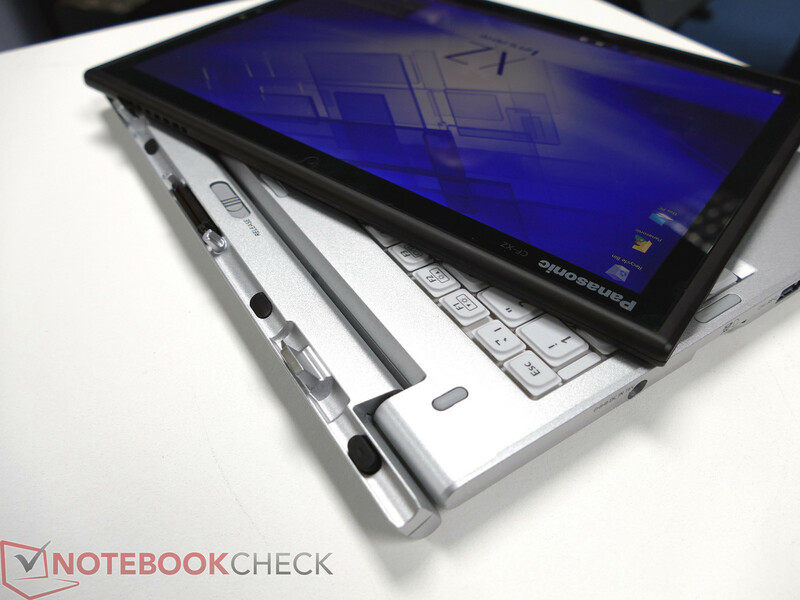 The detachable with a total weight of about 1.2 kg (~2.6 lb) lacks prominent bumpers and features many interfaces. 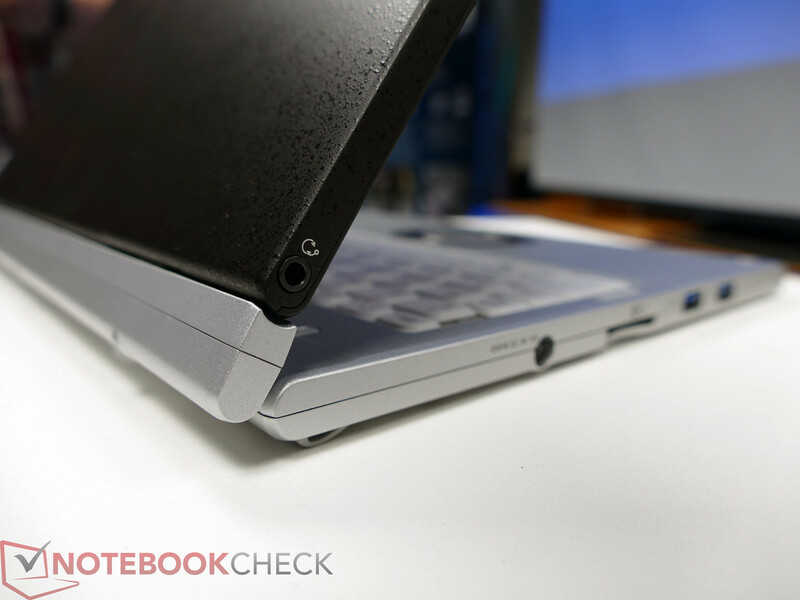 On top of that, it delivers a battery life of up to 14 hours. 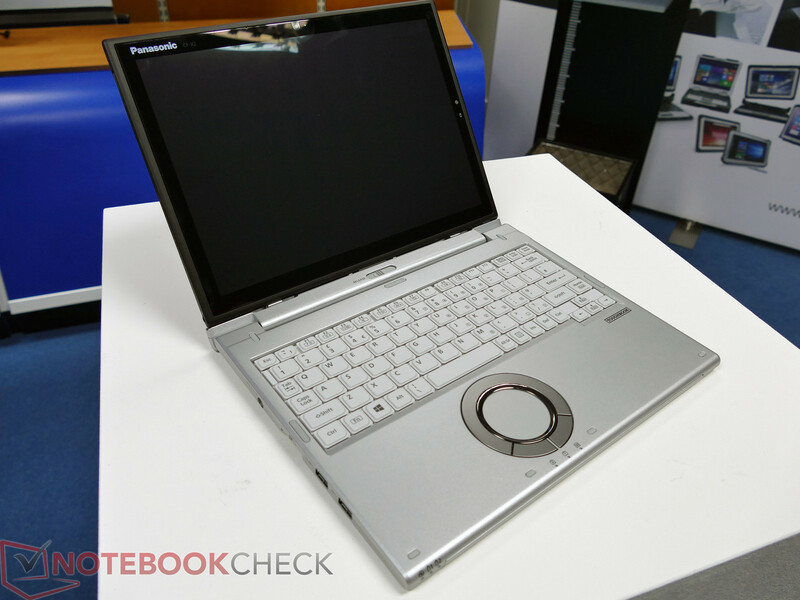 Panasonic continues to see growth potential in the notebook market, especially in the convertible and detachable range. 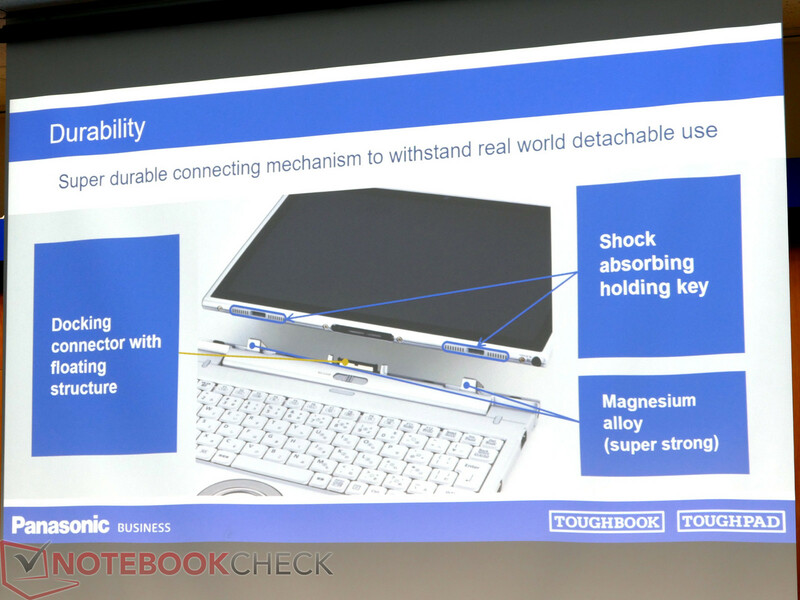 After the launch of the Toughbook CF-33, a "fully rugged" convertible, which can even withstand most adverse settings, at the Mobile World Congress (MWC) earlier this year (we reported), the manufacturer wants to strengthen its position in the business rugged range with the new Toughbook CF-XZ6, which is also supposed to withstand such scenarios. 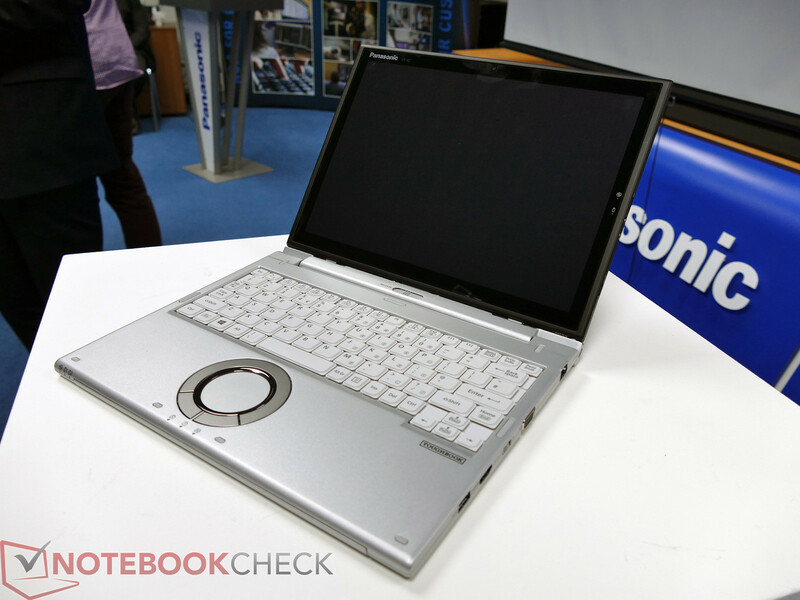 Business rugged devices are notebooks, tablets, and convertibles, where you cannot necessarily tell from their look that they can also survive rough users and hard operating conditions. 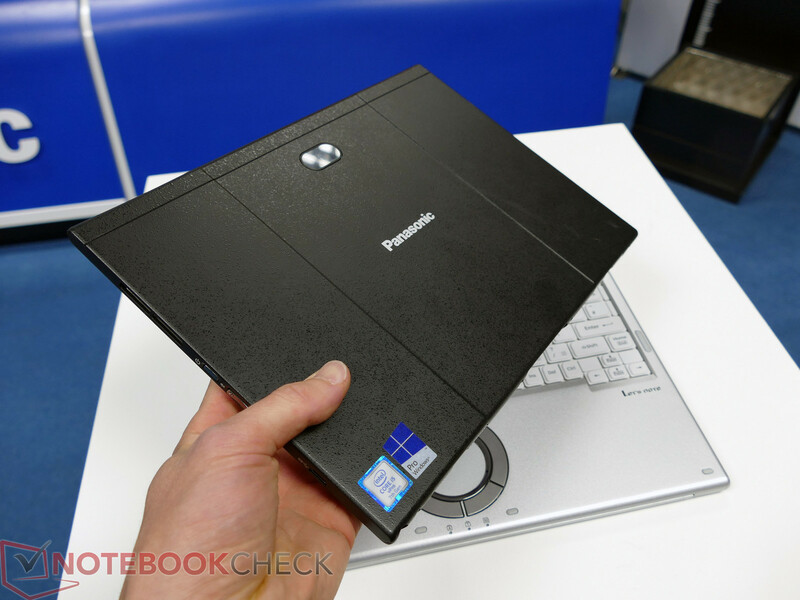 However, they still differ significantly from standard business notebooks on the inside - according to Panasonic. 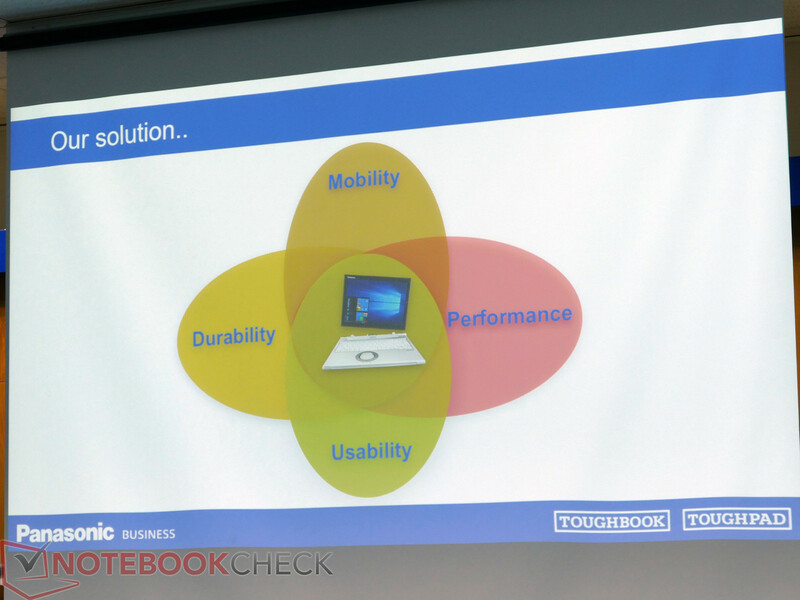 The new Toughbook CF-XZ6 has, for example, been designed for use in heath service and trade, but also for field workers, who might find a particularly robust device in the CF-XZ6, which does not need to hide behind usual devices in these scenarios in terms of look and mobility. 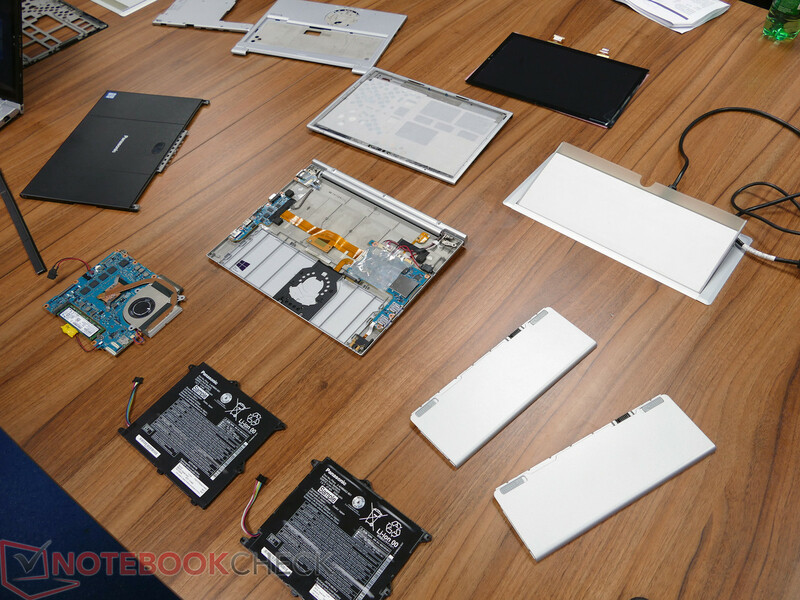 Suitable to the hardware, Panasonic also offers many service and support options. Upon customer requests, even individual solutions are developed and produced, for example docking stations. The concept of the CF-XZ6 is based on four pillars: durability, mobility, performance, and usability. 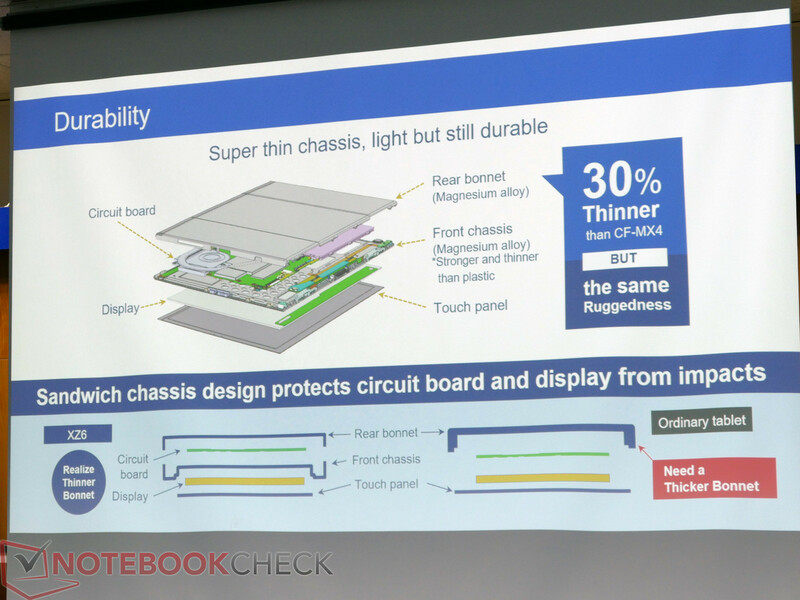 According to Panasonic, they have focused on balancing these aspects, in order to reach as wide a user range as possible. 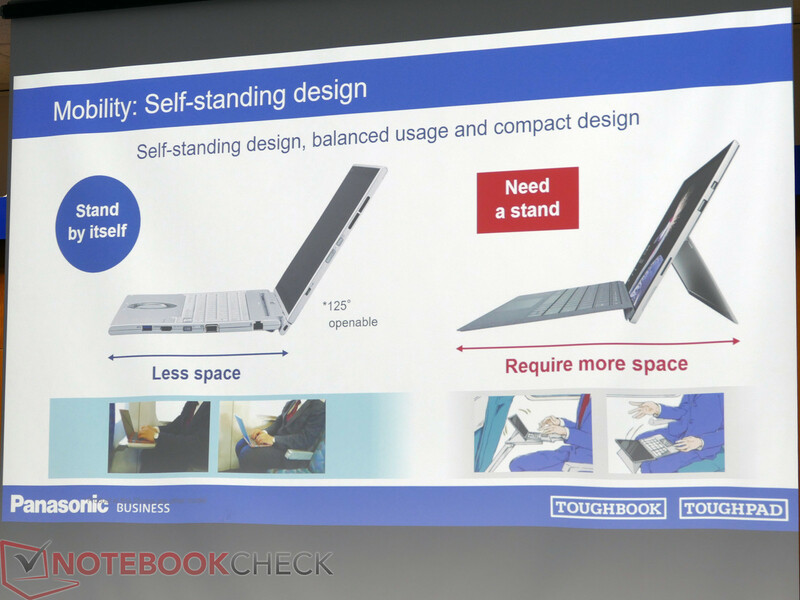 The Panasonic ToughPad CF-XZ6 for example, has been designed for surviving a fall from a height of up to 76 cm (~2.5 ft/controlled fall). 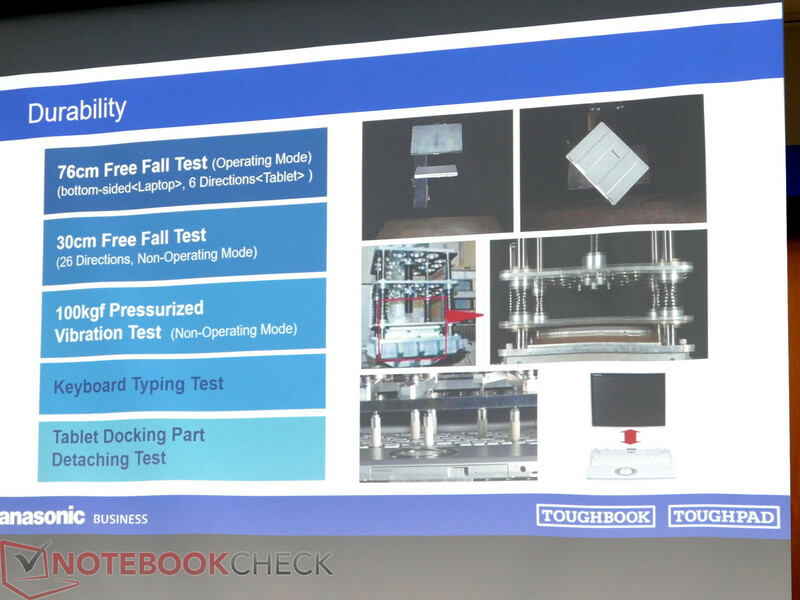 Surface pressure up to 100 kg (~220 lb) was also tested and developed accordingly. 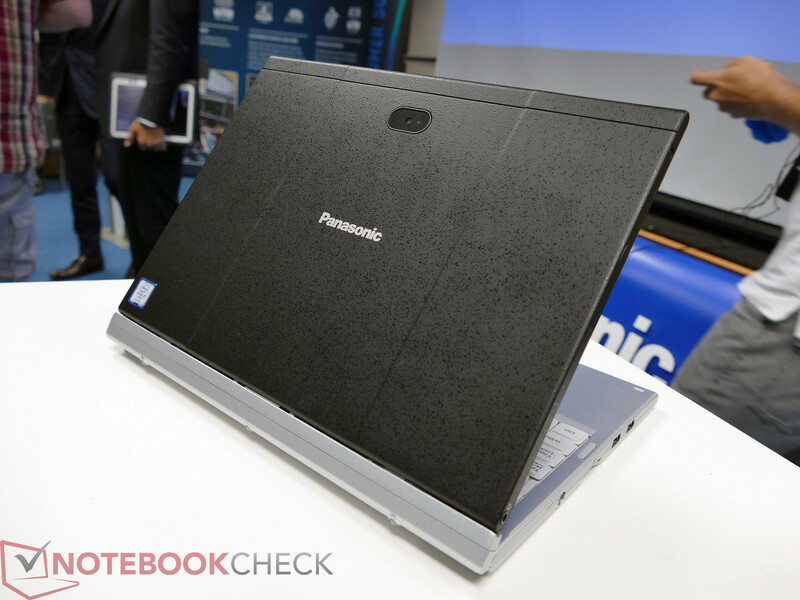 According to Panasonic, the design of the docking mechanism, which connects the tablet unit with the base unit of the notebook was particularly challenging. Magnesium is used as material, since it combines high stability with low weight here. 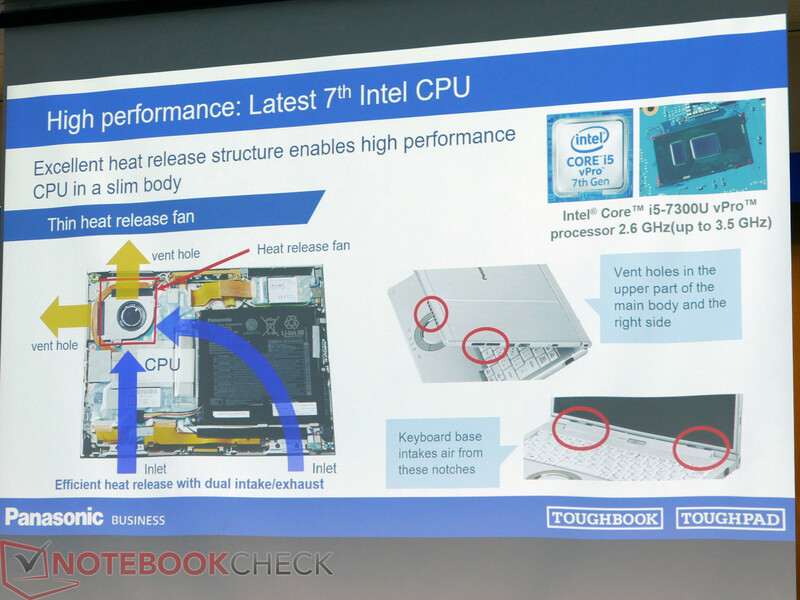 In addition, the mechanical joints were designed in a way that they dampen shocks and allow motion by not being stiffly connected to the case ("floating structures"). This concept is also used for the other components inside, which are connected to each other in a flexible way, so that they can withstand torsions and shocks particularly well. 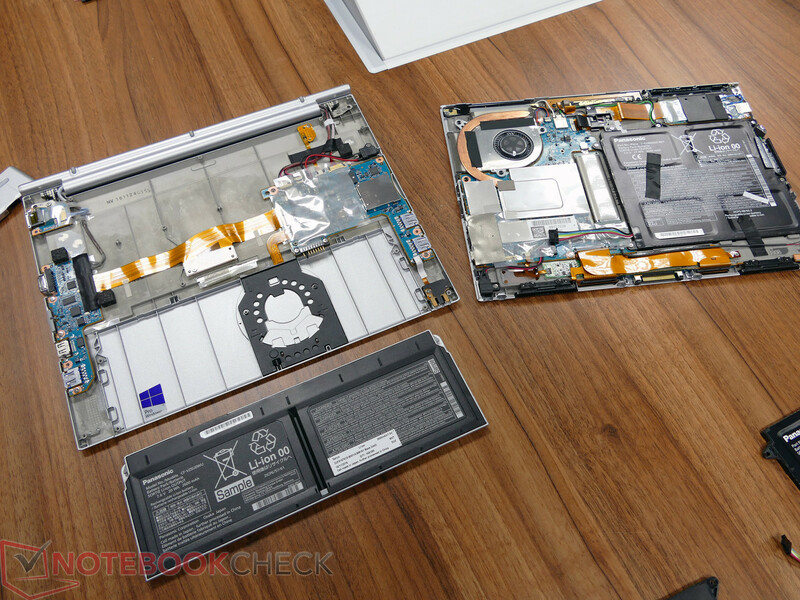 The display unit is also constructed in a different way than standard tablet products: For example, the electronic components (motherboard, memory, battery,) are sandwich-like enveloped and protected by two magnesium parts. The display itself and the touch panel sit in front of this construction. 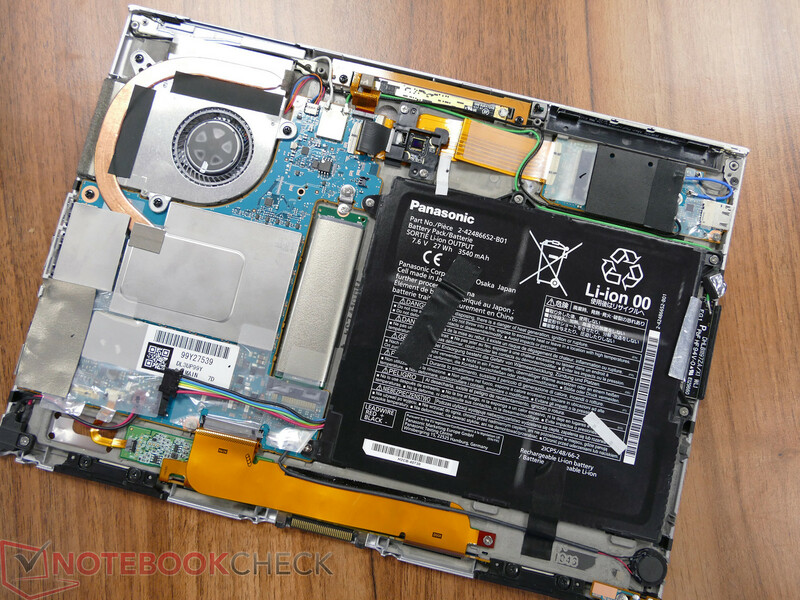 In this way, the manufacturer wanted to create a very durable and robust tablet construction despite the especially slim build (under 10 mm/~0.4 in) and low weight (640 g/~1.4 lb). 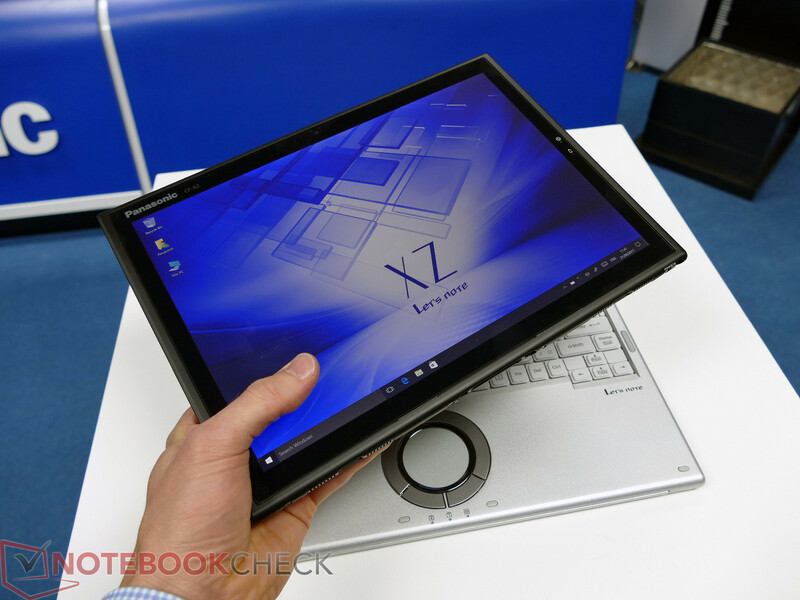 The ToughPad XZ6 has also to deal with the opposite criteria, performance and battery life. 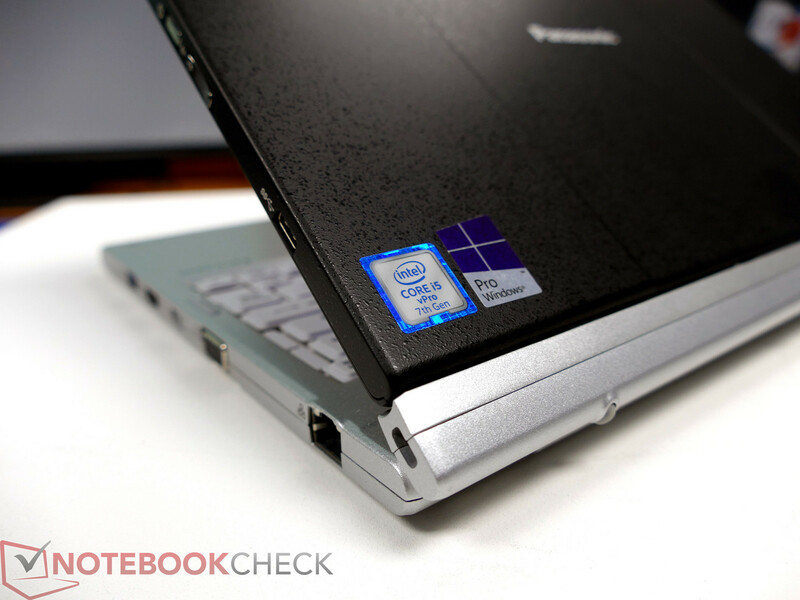 Performance is provided by a fully-fledged Intel Core i5-7300U vPro CPU (2.6 to 3.5 GHz), which performs significantly better than passively cooled solutions (Core m), and positions the convertible as fully fledged work device. 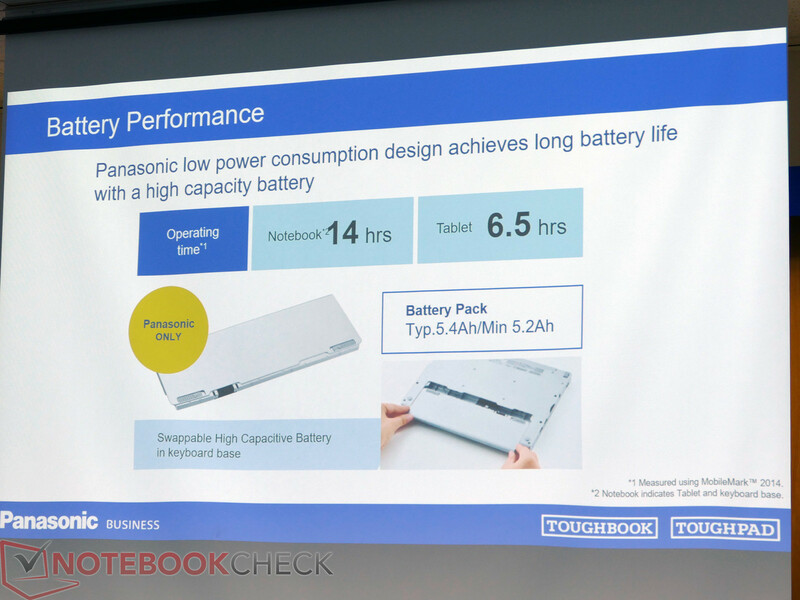 In terms of battery life, Panasonic uses two separate cells. 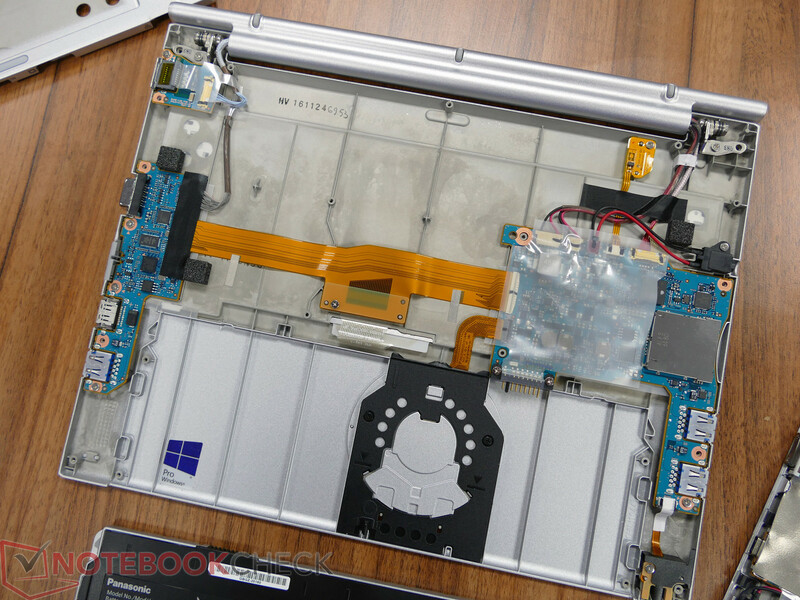 The tablet unit comes with a lithium ion battery with 27 Wh, while the base unit integrates a user replaceable battery with a capacity of 2x 20 Wh. 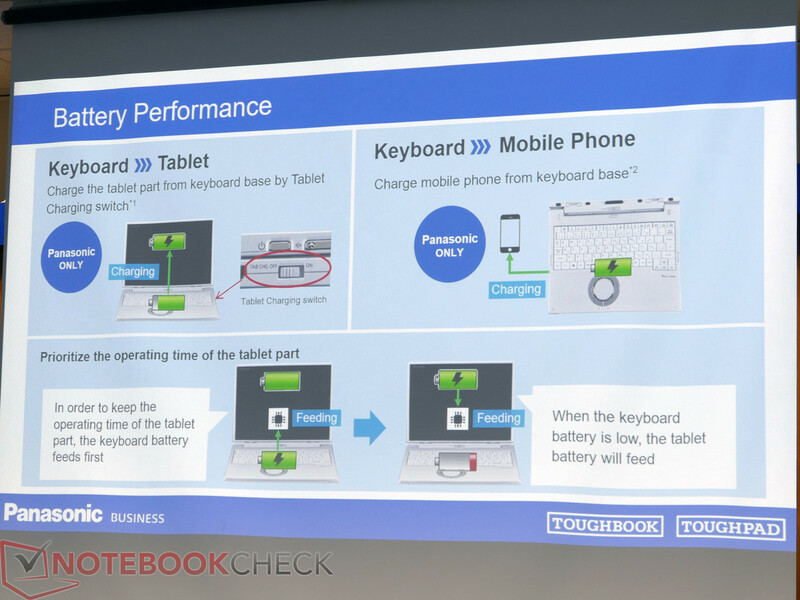 As a notebook, the device is supposed to reach a battery life of up to 14 hours, 6.5 hours (MobileMark 2014) are supposed to be possible in tablet-only mode. It heavily depends on the use, whether these optimistically appearing values can actually be reached in practice. 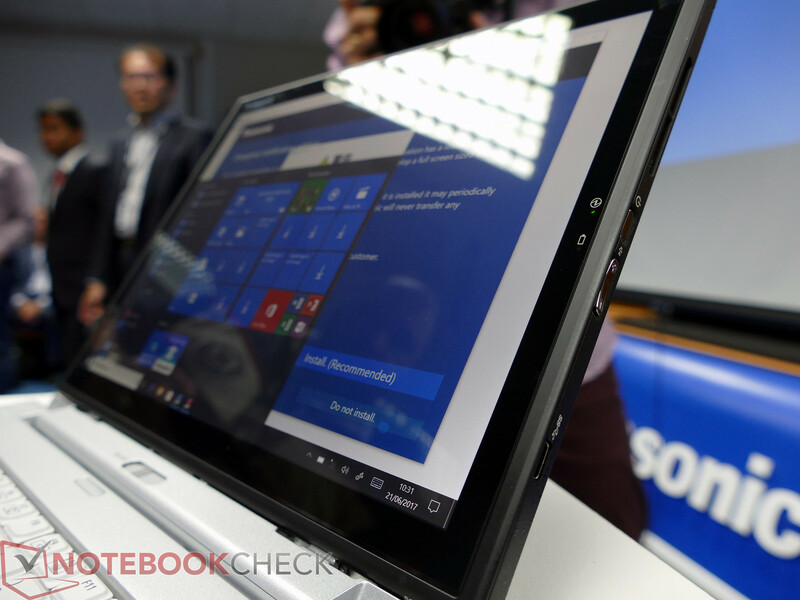 When docked, the tablet unit can be charged from the base unit. 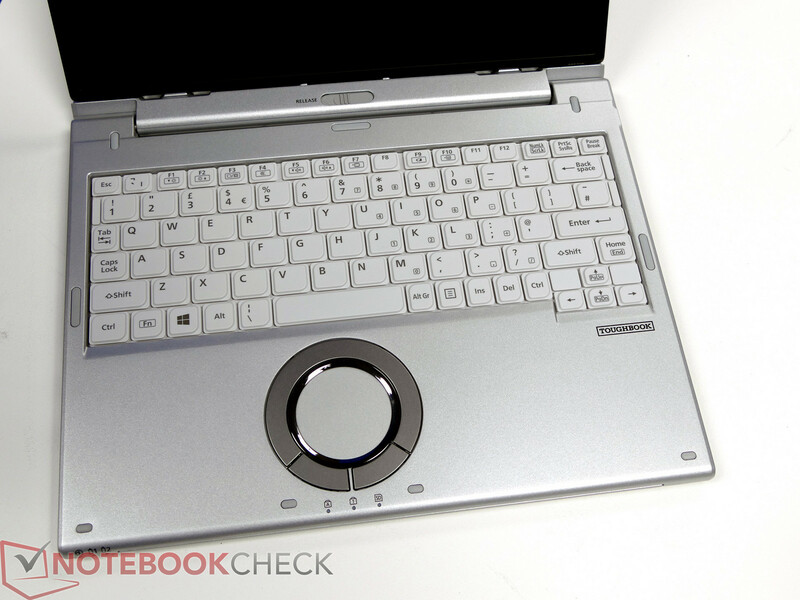 The CF-XZ6 even features a dedicated mechanical switch for this. Certainly, the base unit can also be used for charging external devices, such as a smartphone. 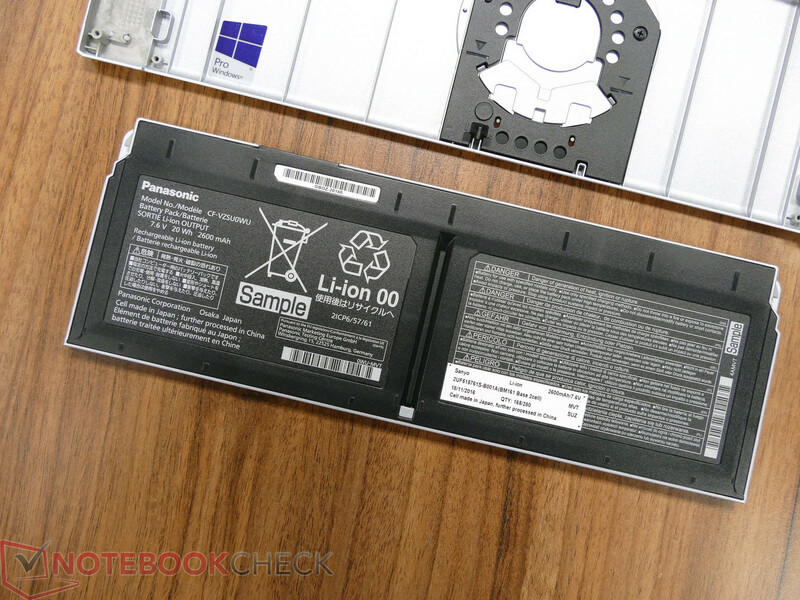 If the battery of the base unit runs down, the tablet continues to provide it with energy, so that all features of the dock can still be used. 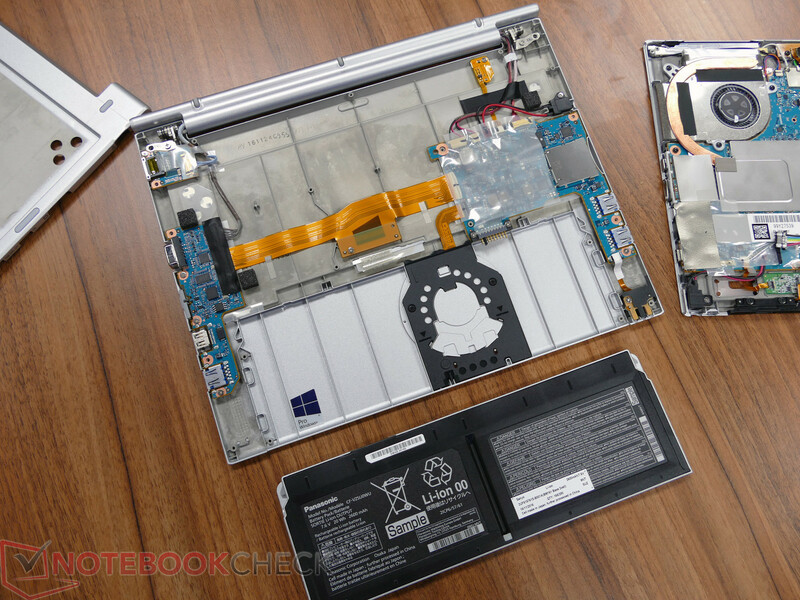 When tablet and the base unit are combined, the battery in the base unit is "hot swappable", i.e. it can be replaced during operation. 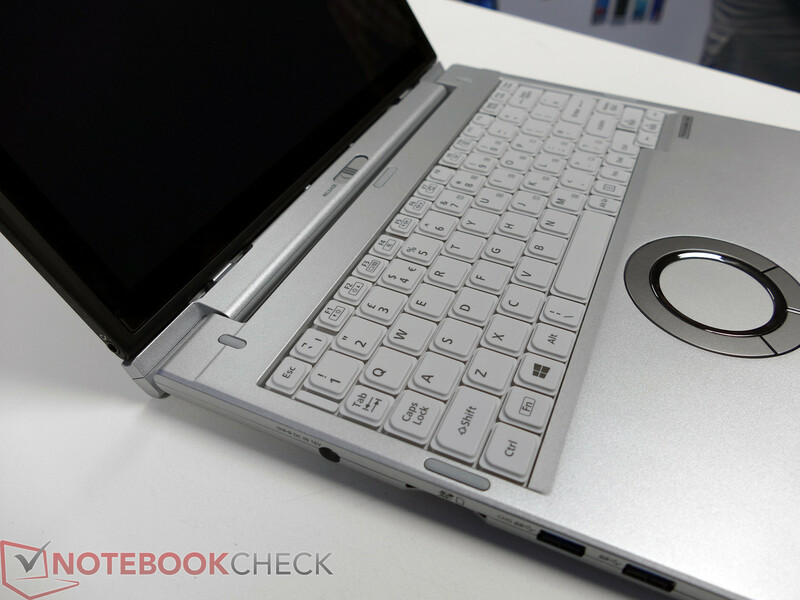 The keyboard with a conventional layout (not a chiclet-type) is supposed to ensure user-friendly use. 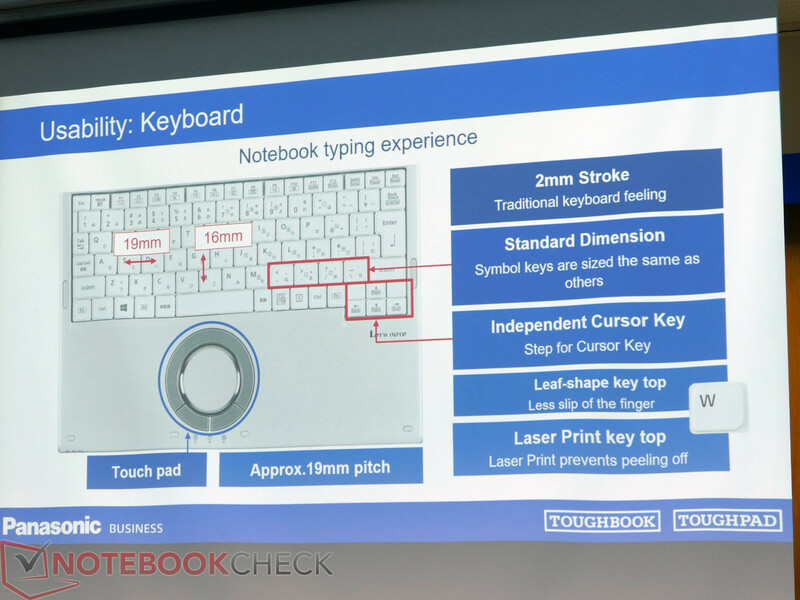 The keystroke is 2 mm (~0.08 in), the arrow keys are separated, and the key heads are slightly concave. In addition, the inscription of the secondary key function is enlarged and the key labels are done with a special laser print, which is supposed to prevent peeling off. 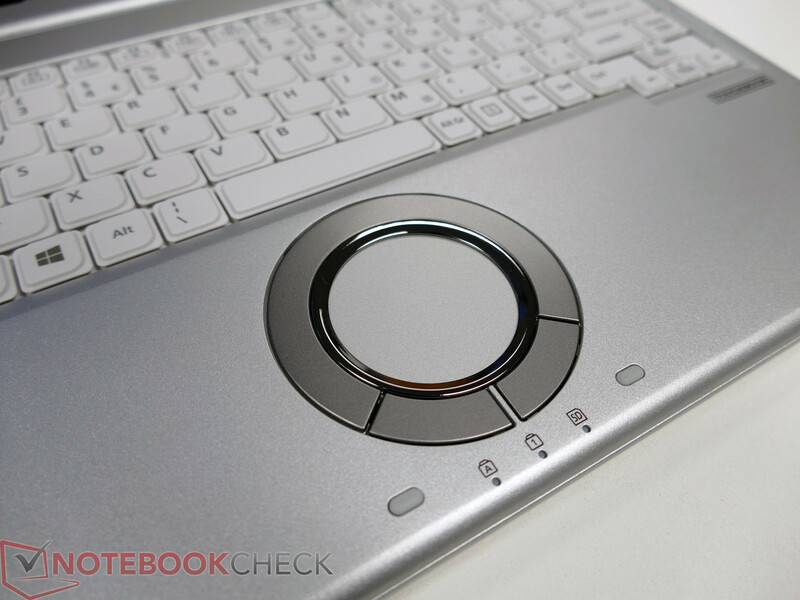 The round touchpad is striking. 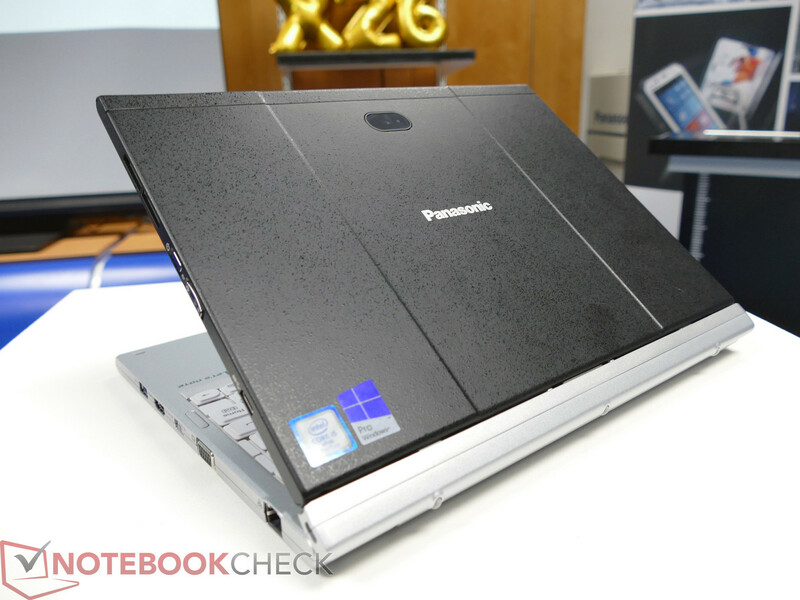 According to Panasonic, it is supposed to bring advantages when scrolling through documents. In addition, it has been optimized for the CF-XZ6 with a special system software. 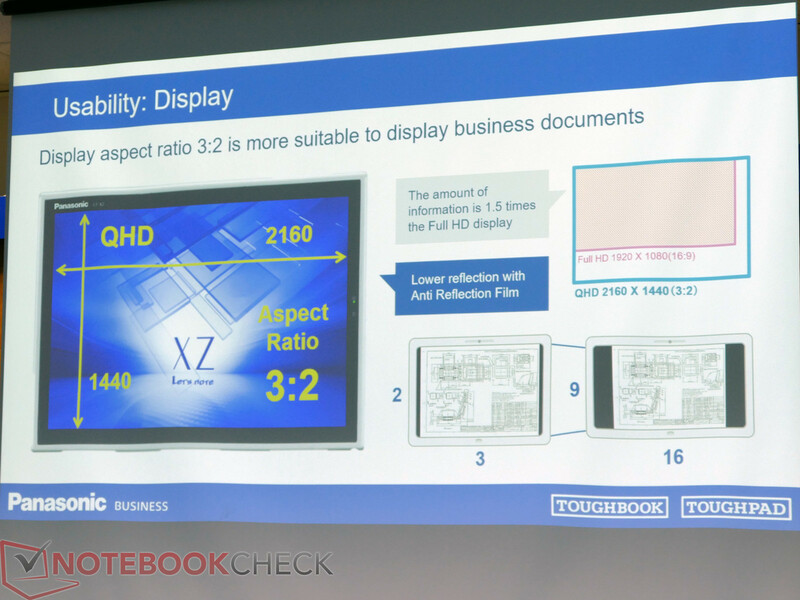 In terms of display, Panasonic uses a 12-inch panel with a rare aspect ratio of 3:2 and a resolution of 2160x1440 pixels (QHD). 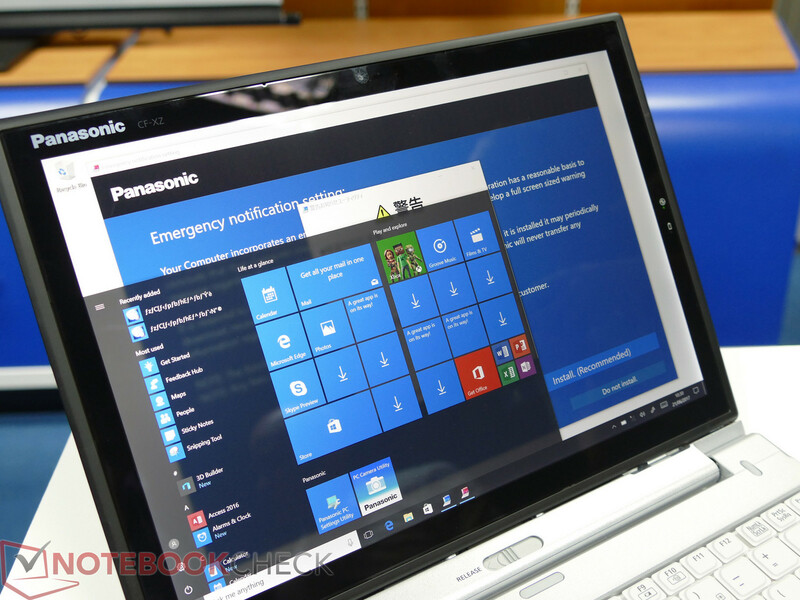 According to Panasonic, this format meets wishes of customers who find this aspect ratio advantageous when compared to the usual widescreen formats of consumer and business notebooks. 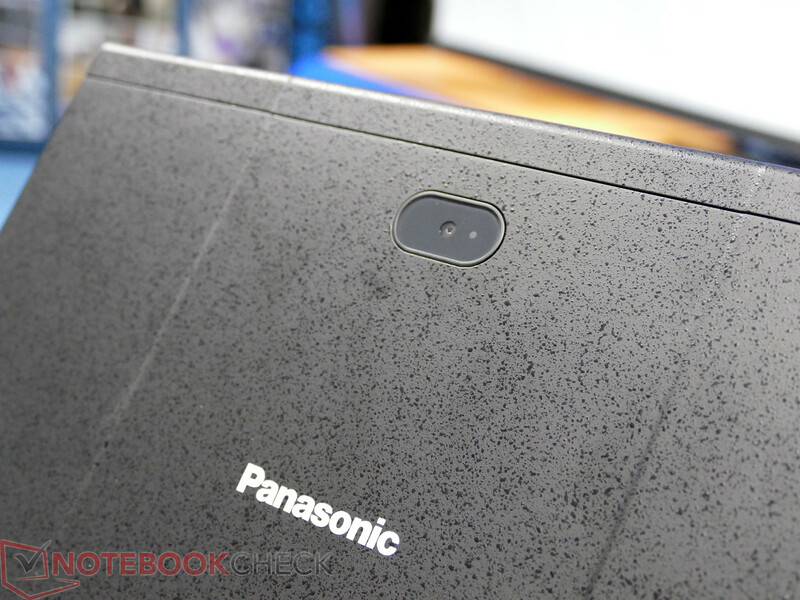 Although Panasonic mentions an "Anti-Reflection Film", i.e. a coating which should dampen reflections, the shown pre-production devices tend to reflect quite heavily because of the glossy surface. The connectivity is very generous. 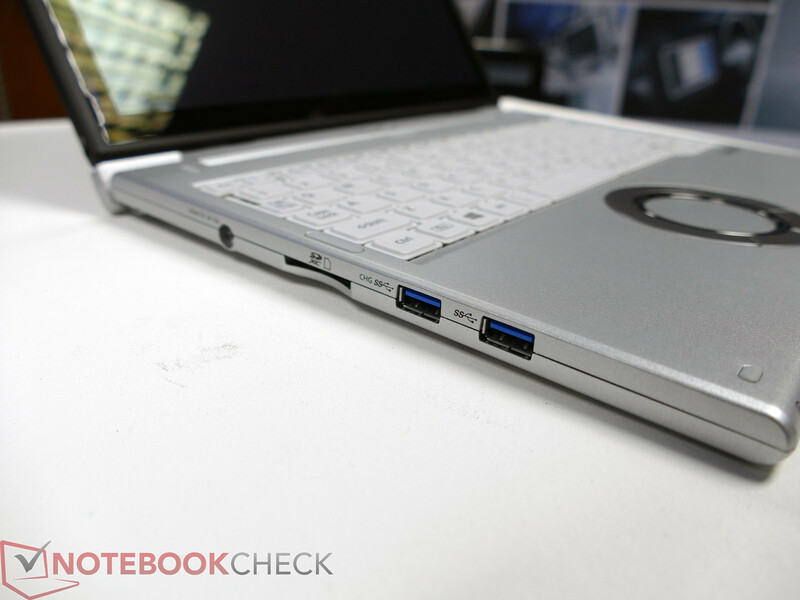 The basic unit features a total of three USB 3.0 ports, an SDXC card reader, as well as full-sized HDMI, VGA, and LAN. 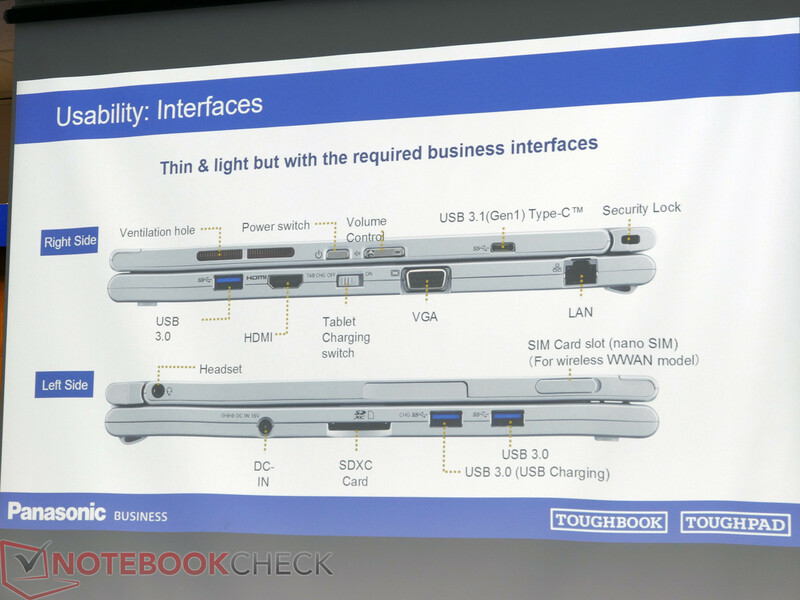 The tablet unit adds a USB 3.1 type-C port (gen. 1) and a 3.5 mm headset jack. A security lock slot is also available. 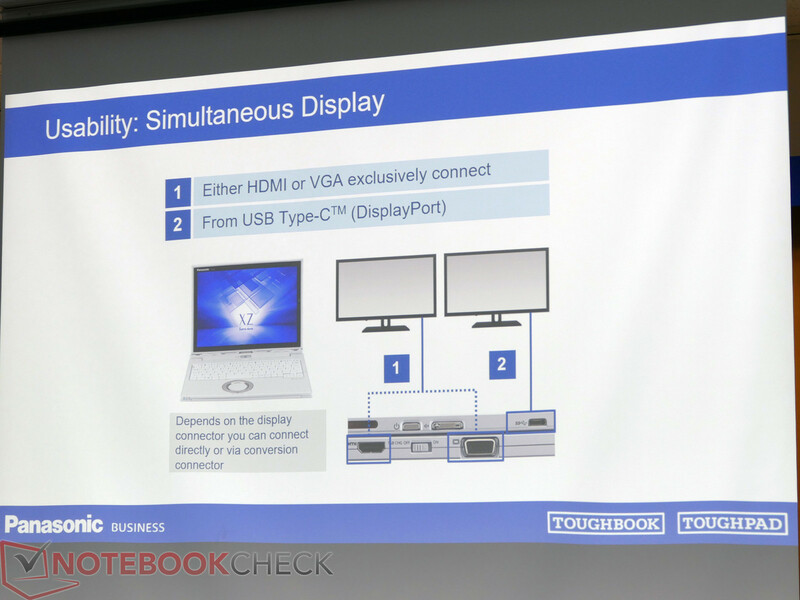 It is possible to drive two external displays via HDMI or VGA, respectively, and the type-C port in the tablet. 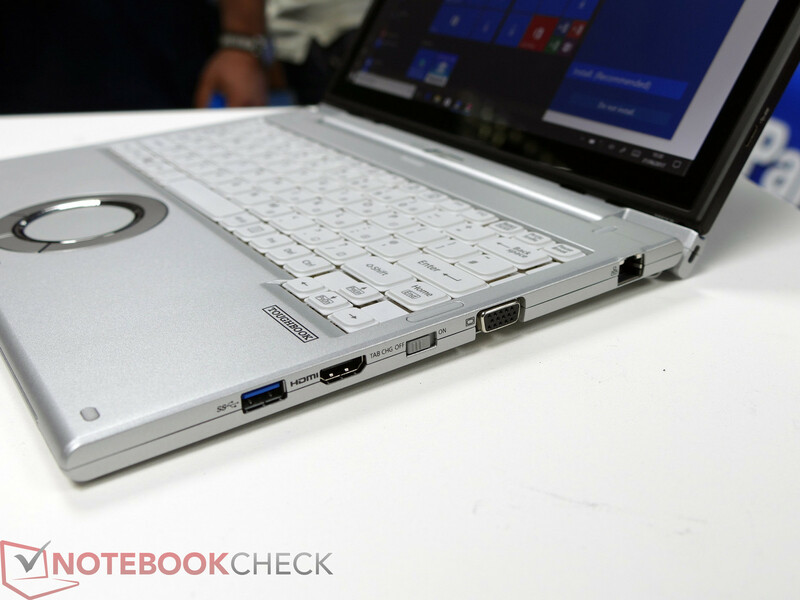 The Panasonic Toughbook CF-XZ6 will be available from July and the standard configuration (i5, 8 GB of RAM, 256 GB SSD, no 4G) will cost 2081 Euros (~$2330 excluding VAT) or 1.539 GBP.